IPD Saves Time & Money | Grunau Company, Inc.
IPD has helped the Akron Children’s Hospital (ACH), Critical Care Tower project to save time and money not only for the owner but for all of the contractors and other parties involved in the new 7-story tower. Integrated Project Delivery (IPD) is a Lean process that is dependent on collaboration between project team members. The project team is chosen very early in the design process, typically before schematic design is completed. The environment created with this pro-active approach is one of openness and collaboration between team members. In short, everyone has a voice and a chance to contribute to positive outcomes. 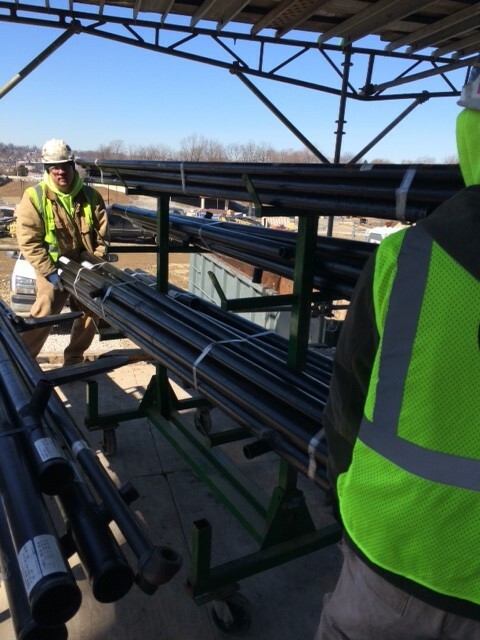 The Construction Manager (CM) on the ACH job, Welty-Boldt (a joint venture with The Boldt Company and Welty Building Company), was committed to establishing a Lean culture amongst all trades on the project. Lean training was performed as part of the on-boarding process and Lean concepts were promoted in all of the planning meetings. For many of the “old school” project managers and superintendents, a project so focused on Lean was initially a tough pill to swallow. Despite the resistance, the CM never relented on their mission to establish a project-wide Lean culture and even the staunchest Lean opponents would probably admit to taking away some benefits on this IPD project. Pull planning meetings, last planner meetings, safety walk-throughs, quality checks and report-out meetings are weekly occurrences. Every morning at 6:30 am, all foreman take part in a daily huddle to discuss their daily work plan. One week every month is “Team Week” consisting of basically 5 days of almost constant oversight meetings, financial report-outs, etc. HKS, Hasenstab, Welty-Boldt and Akron Children’s Hospital are the primary tri-party members of the IPD contract on this Ohio job, while Grunau Company is doing the fire protection work at the Akron Children’s Hospital. Since Grunau is always committed to continuously improving its own processes, this IPD project was an opportunity to shine. Financial transparency is one component of IPD. Grunau met its own goal of coming under the original estimate by a specific dollar amount. Even though this was a time and material (T&M) project that was cost reimbursable, Grunau worked hard to increase its productivity with various Lean initiatives because it was in the best interest of the customer and the project team as a whole. Therefore the amount saved will go back to the project as savings. This “team-first” attitude is uncommon in the industry but makes perfect sense to Grunau. One Lean principle used on this job was just-in-time deliveries. These are precisely timed material deliveries for material that will be installed within a week’s time. This process keeps the jobsite cleaner, safer, and the installation crews focused. Other Lean innovations included scissor lift workstations to cut down on wasted sprinkler fitter movement, and using a moveable Baker scaffold as a print table with storage beneath to keep pipe ID labels and sprinkler heads close at hand. The IPD delivery method is still a novel concept in the Midwest and this project, in many ways, was “cutting edge” for this region. Grunau proved to be a reliable Trade Partner, always accountable for its commitments and thanks to a strong team, were able to succeed with this IPD project.